Lavender has been used for treating a variety of conditions, including anxiety, insomnia, depression, headaches, hair loss and skin disorders. 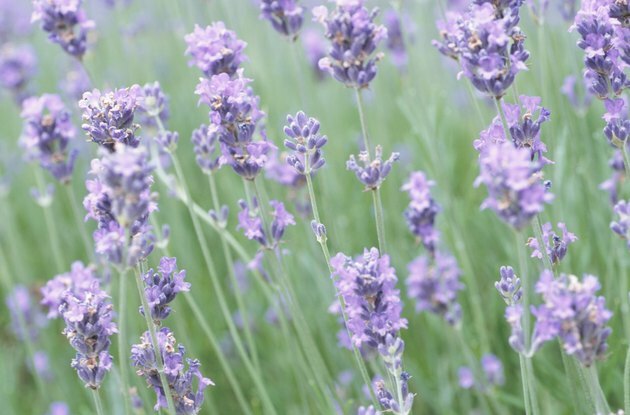 Lavender produces sedative, soothing effects when inhaled, according the University of Maryland Medical Center, but research does not support most other medicinal uses. Besides aromatherapy oil, lavender may come in the form of teas, tinctures and diluted solutions for topical application. The various forms of lavender may not be used interchangeably. Lavender oil, for example, is toxic if ingested. The potential side effects of herbs such as lavender offer a good reason to use herbal treatments under the supervision of your health care provider. Topical use of lavender oil in products such as shampoo, soap and skin lotion, may lead to enlarged breast tissue in boys. Prepubertal gynecomastia, enlarged breasts prior to puberty, is a rare condition and its cause is often not identifiable, according to the National Institutes of Health. A pediatric endocrinologist at the University of Colorado at Denver first suspected a link between lavender oil use and gynecomastia after diagnosing three young males with the condition. A study reported in a 2007 issue of the "New England Journal of Medicine" found that lavender oil is an endocrine disruptor, a compound that may interfere with hormone production or activity. Laboratory studies confirmed a doctor’s observations, demonstrating that lavender oil inhibits the effects of androgen, the hormone that controls masculine characteristics, and mimics the actions of estrogen, the female hormone responsible for the growth of breast tissue. Few physical complications result from gynecomastia, but psychological and emotional problems may occur. Boys or men with enlarged breasts can see their condition as embarrassing or stressful. The problem can be difficult to hide, make them a target of teasing and cause them to feel unhappy with themselves. Males with gynecomastia may feel like their bodies have betrayed them. Several months after discontinuing the use of products containing lavender oil gynecomastia should clear up, or at least will have subsided, according to the National Institutes of Health. Researchers do not foresee any long-term effects on hormone levels following discontinuation of lavender oil use. Men struggling with infertility may also wish to avoid the use of lavender oil, suggests New York University’s Langone Medical Center. Though only limited evidence exists to support lavender oil’s testosterone-blocking nature, men can eliminate one possible contributor to low fertility or infertility by avoiding products containing lavender oil.